New Delhi – Ladakh – Srinagar – New Delhi. This one is the Holy Grail for all the bike riders of the world – 3200kms of the toughest terrain any biker can bargain for. Starting the preparation. Having done it already in 2012 as part of Royal Enfield Himalayan Odyssey, 2012, I know what it takes. This motorcycling journey would cover 3 mountain ranges, six passes and touch the daring heights of 18,380 feet at Khardung La – world’s highest motorable road and brings you to Ladakh – the land of high passes. Last time, I rode there I was 30. Now, I would be 36. Can the body sustain the ride? The weather, the oxygen or rather the lack of it, the terrain, et al? It commands a grilling fitness regime before you even venture into thinking about this Trip – both for you and your Enfield. Trying to stay true to it. Despite the challenge it offers, there isn’t any dearth of bikers who have done this trip – you’d find so many of them, try searching on Google! However, my earlier travel to Ladakh taught me a useful lesson – every ride to this Himalayan abode will be a new test, an altogether different one every time you venture on it; it doesn’t get any easier with earlier experience that one may have of riding on to this absolutely stunning journey. This ride can be a truly difficult learning experience – it tests you on much more than expert biking skills; it teaches many things too – about yourself! Every biker dreams about this Trip. Having done that already, I am daring to relive this dream yet again this year, and making it go real very soon. “If you go to the Odyssey as a boy, you will return a man; if you go as a man, you will return a sage, and if you go as a sage, surprisingly you will return as a boy”. Those were the words with which Dr. Venki Padmanabhan, then CEO of Royal Enfield, flagged off the 2012 Himalayan Odyssey, 2012. Am I trying to find that boy in me? Shall keep you all posted on this ride of a lifetime! They say, a simple news snippet can give birth to a lot of actions. It happened with me this May, when the news channels aired that the gates of the famous Badrinath Dham Temple opened on 1st May. That’s when I decided to ride my Royal Enfield to this revered site of Hindu pilgrimage situated upon the peaks of the Garhwal region of north Indian state of Uttarakhand. Nitin, my younger brother and a newly christened biking-enthusiast, readily agreed to join in. We decided for a four-day trip. Well, it is exactly 1100kms journey to & fro Gurgaon that we had to cover. Keeping in view that nearly 600kms out of them were on the mountainous terrain, it was a tall feat we planned! 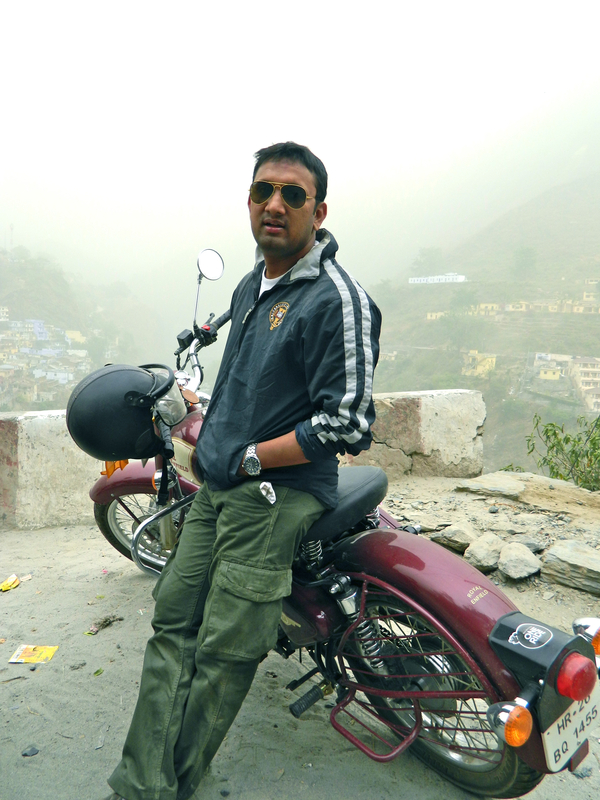 Day 1 – 17-May: Gurgaon-Rudraprayag; 394kms. We planned to leave Gurgaon at 5am – after all, we hoped to cover almost 400kms and reach Rudraprayag – our first night-halt. As it always happens, anxiety and excitement ensured neither of us slept properly the night before! I was well awake when it started pouring at 3am; then arrived the rogue winds, as if daring and deterring us from commencing the trip! Deterred we were not, and started sharp at 5am. Taking NH-58 via Ghaziabad, we sailed through the National Capital Region of Delhi. Almost negligible morning traffic and superb highway stretch after Meerut bypass ensured we cross Meerut and Muzaffarnagar smoothly. At 8:30am, McDonalds Plaza before Muzaffarnagar was our first break, and by now we had covered 140kms. A scary incident happened here. As I mentioned earlier, I didn’t sleep at all the previous night. As we left the toll-road and entered the single-road after Muzaffarnagar, pangs of sleep started to hit me on & off. Mindlessly, I kept riding. However, at one point, body gave away to the call of sleep and the bike swerved! Sheer luck I could control it; stopped at the next dhaba and dozed off to sleep on a charpoy in the open! Remember our roadside dhabas always house one? A brief power nap of about 60min and I was charged again. And learnt a life-saving lesson – never compromise on sleep night before hitting the road. We reached Purkaji well in time. Here, instead of driving towards Roorkee-Haridwar route, we took a slightly less-travelled road, turning right to Laksar-Haridwar route. 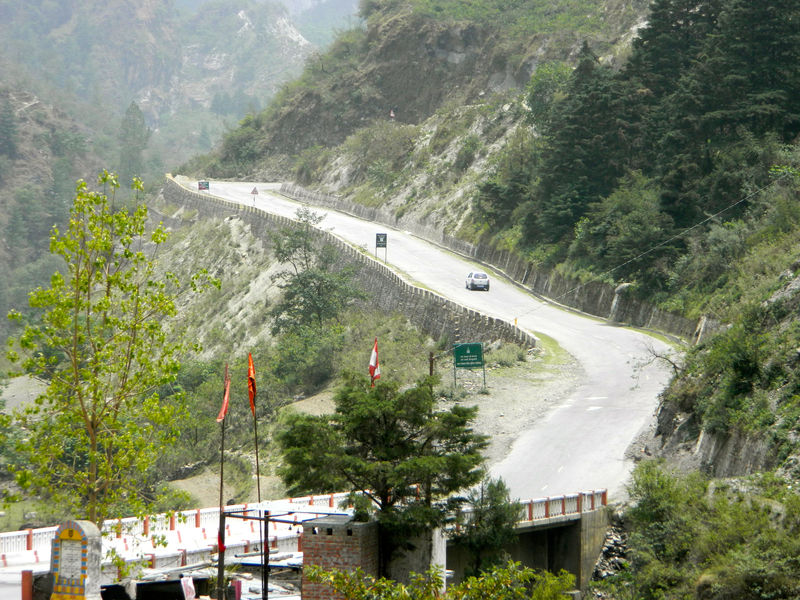 This is a low traffic road connecting Purkaji to Haridwar, and is approximately 7kms longer than the Roorkee route. However, decent roads and limited traffic helped us sail through and we reached Haridwar-Rishikesh bypass by 12:30pm, thereafter hitting Rishikesh at 1pm. We halted at Muni Ki Reti, a bathing ghat of Rishikesh; we had completed 265kms and reached the foothill of our mountainous journey. A quick, refreshing dip in the holy Ganges and a brief lunch of fruits (trust me, that’s what you should eat when riding a bike for such long trips! ), we resumed the ride. 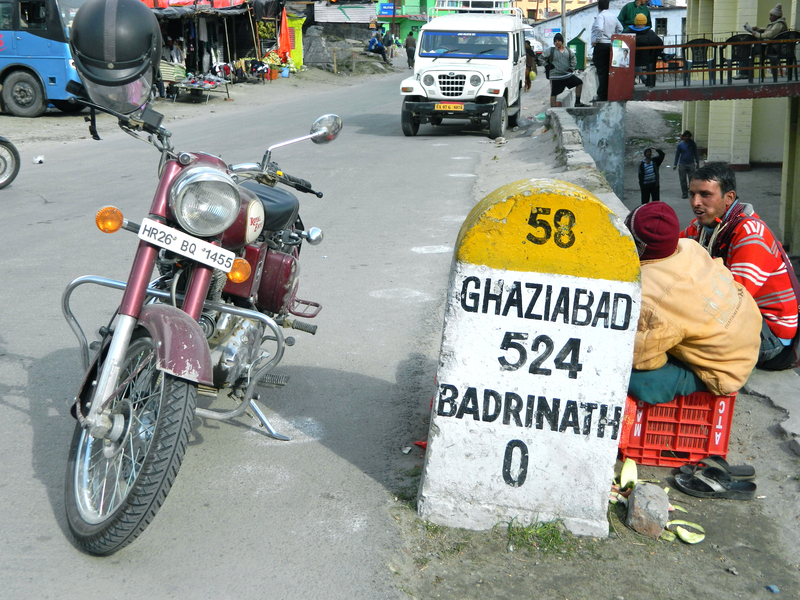 From Rishikesh to Badrinath, it is a ride of 294kms, stretching over several mountain ranges. It covers famous Panch-Prayags – Devprayag, Rudraprayag, Karnapragyag, Nandpragyag and Vishnuprayag, in the ascending flow of their occurrence. Prayag, in Sanskrit, means ‘confluence’ and Panch Prayags represent the five sacred river confluences. 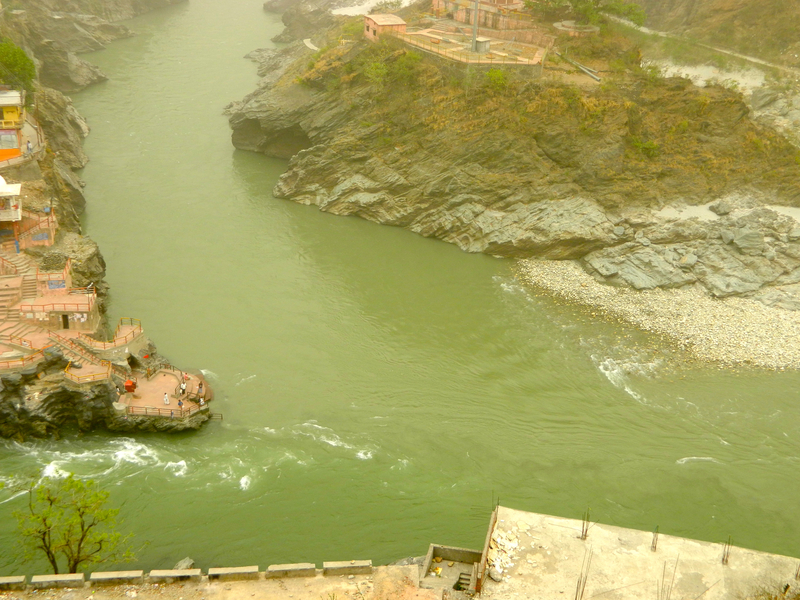 These rivers are – Alaknanda, Dhaulaganga, Mandakini, Pindar and Bhagirathi. Pilgrims take a dip in the river at these locations before embarking on visiting the holy shrines in the ‘Deva-Bhoomi’ (God’s Land), as Uttarakhand is commonly referred to. 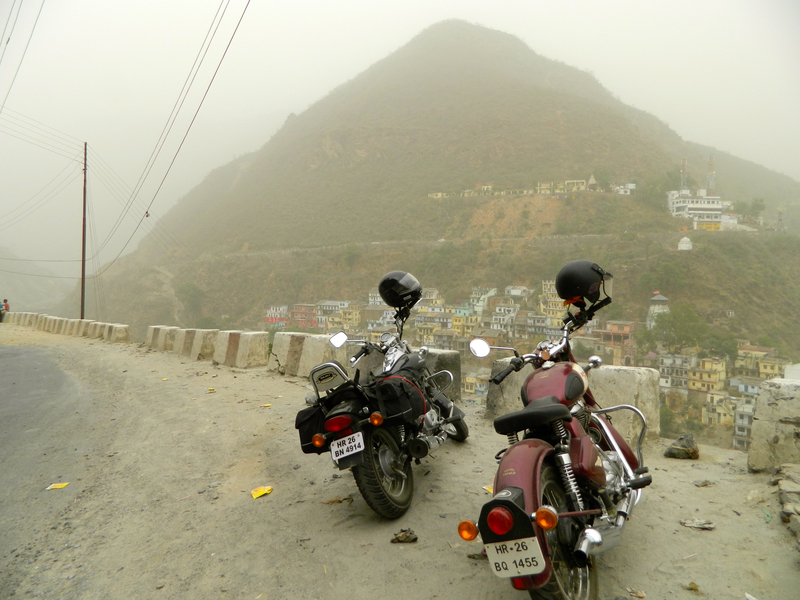 Ride to Devprayag – our next destination at 65kms – was really smooth. Once on the hills, you will find several spots selling all types of eatables all through the ride. At 4:30pm, we left Devprayag to ride another 70kms towards Rudraprayag. I must say, roads in this whole stretch of 135kms were in real good condition and thus, despite the hilly terrain and our aching backs & arms; we arrived in Rudraprayag by 6:45pm. Herein I would add – we were true bikers during this trip, with no hotel bookings done pre-hand! My travelling experience in the hills all these years taught a simple lesson – while it is good to plan a trip in the Himalayas, it is not wise to pre-book the stay, specially if you are riding motorcycles – you don’t know where the weather and road conditions force you to ditch the plan and take the night-halt! However, we had done our share of some hotel-searching on the net and came across Bhatt Resort, a motel 6kms before the town of Rudraprayag, which was rated high on clean rooms and good service. Well, at Rs.1500/- per night, the place is a steal – hot water, great location, good vegetarian food and the sight of river flowing by – all are worth it. Would recommend it to all travellers on this route. 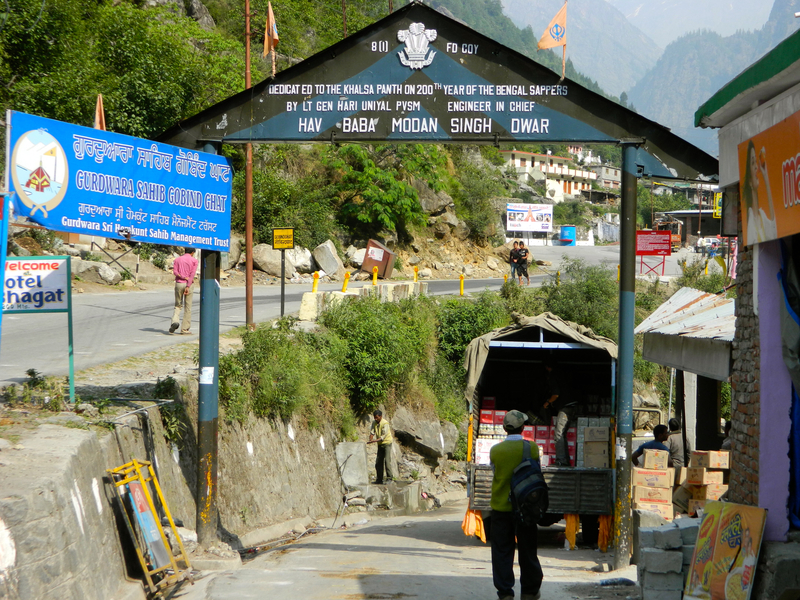 Day 2 – 18-May: Rudraprayag-Badrinath; 159kms. Volini spray did the trick through the night and our backs were game for the final leg of our ride towards Badrinath via Joshimath. 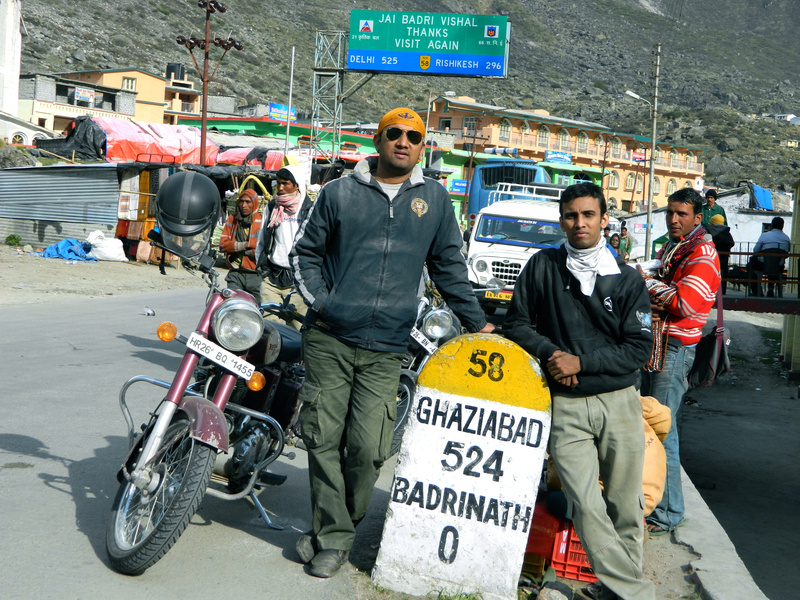 We started the ride at 8:30am sharp and hoped of arriving in at Badrinath by 3:00pm. 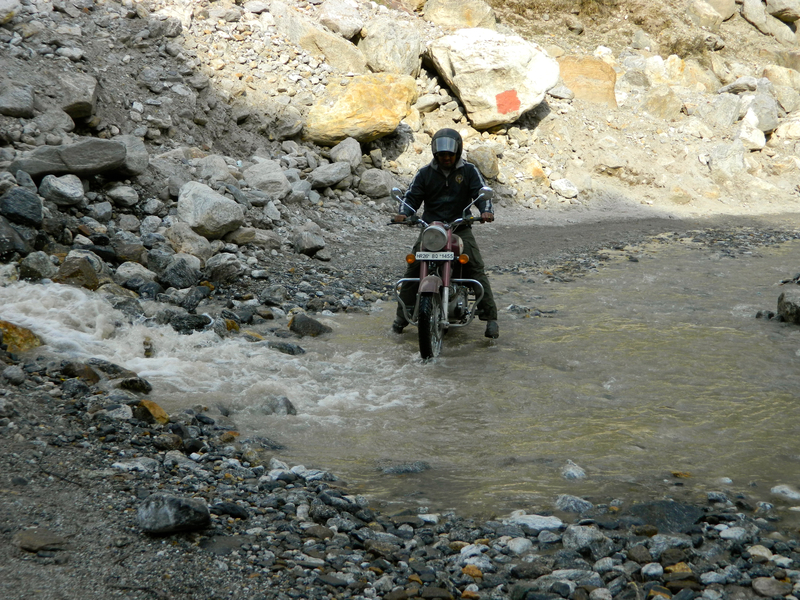 Well, that’s one thing about planning of the Himalayan trips – it can all go wrong! This stretch is a wonderland – really great roads and absolute lack of roads co-exist so well here! I found these roads to be a biker’s delight and nightmare – both at regular intervals. 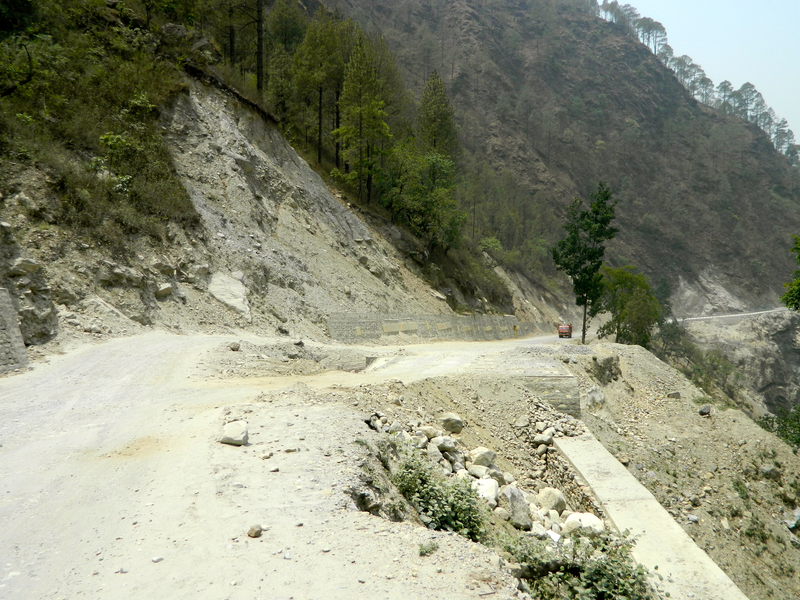 After Rudrapayag, roads between Nagrasu and Gauchar – a 5kms stretch is really bad. You need to be a really careful rider here. However, very organized, self-disciplined traffic made it bearable for us (only vehicles carrying Delhi number-plates honked even here!). Largely, owing to good roads, thanks to the Border Roads Organisation, and timely water-breaks, we continued our journey. Crossing Karnaprayag, Nandprayag and Chamoli, we reached Srinagar and re-filled our fuel tanks. I am purposely not writing too much about this part of our travel – nothing eventful really happened here. And mind you, though the sights all through were really captivating, I would strongly advise you against taking a peep while a riding a bike; one second’s break of concentration and the slip may be fatal for you! In case you feel like taking a peek, please stop and park at a safe corner and allow yourself the use of the eyes and camera! We arrived Joshimath at 1:45pm. Herein, due to wrong directions given to us, we missed the bypass leading to Badrinath and took the road from inside the town. I would recommend you carefully avoid this route, as a long traffic hold-up can cause a unwanted halt for hours – we were lucky as bikers could pass through the narrow spaces on the sides of the jammed cars and buses! So did we. Some details on Joshimath. It is a popular hill station and a famous center for pilgrimage at a height of 1,890 meters above sea level in Chamoli district of Garhwal division in Uttarakhand. It is the base for trekking to the famous Valley of Flowers. It is connected with a 4km cable car up to Auli, a hill-station famous for ice skiing sports, making it the longest and highest trolley of Asia. Joshimath is the also the home of the oldest tree of India, Kalpavriksha, which stands here from the time of Adi Guru Shri Shankaracharya, who established this town as one of the four maths or monasteries, in the 8th century. Here I should mention – we were advised that there are very few petrol stations and ATMs one the entire route – we found both of them in aplenty on our way, almost every 30-40kms. Badrinath is about 46kms from here. We took our 30-minutes lunch break 2:15pm at the Army Wet Canteen, a small shelter after you drive about 3kms downhill from Joshimath. Great views of the snow-clad peaks, the inviting descent towards what we then thought the last hill to conquer, and superb-tasting bun-omelette – all charged our batteries up. 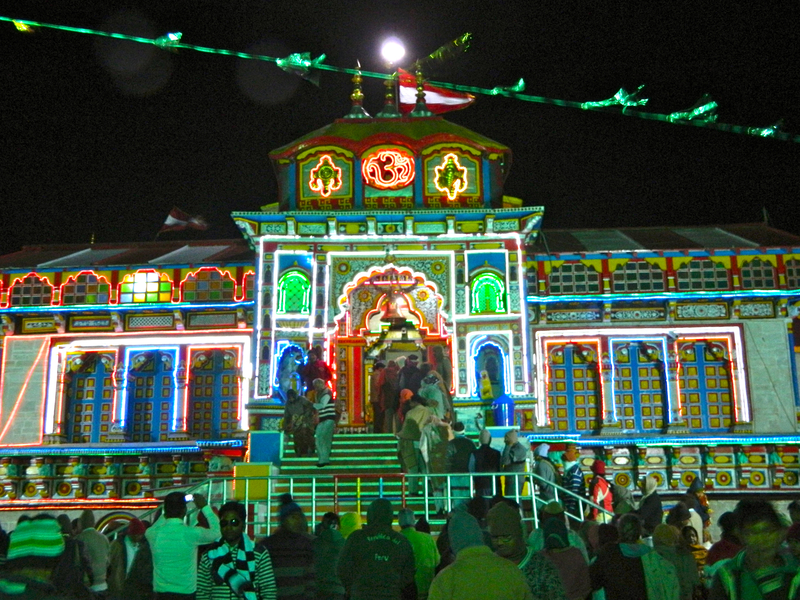 Baba Badrinath – here we come! Well, as they say, challenges come wrapped in good-looking covers – they lure you, tempt you and promise you a smooth sailing. They hide any hint of what you’d come across as you venture ahead. Our ride hereafter was just the same – we came across superb weather, gentle sun and cool breeze on our sun-burnt hands and faces, outstanding roads, low traffic; all this and the fact that we were near the end of the journey – masked clearly what lay ahead of us. During the next 16kms, we passed seven mountain ranges, crossed Govindghat, the base-station of the sacred Hemkunt Sahib Gurudwara, the world-famous Sikh shrine. As we bowed our heads here, we also observed Jaypee Group’s hydro power plant. We also saw a very beautiful site of Shiv-temple, a unique rock-temple built amidst a huge green belt in the valley. Challenges didn’t end with just that. Four more, similarly notorious ditches one after the other acknowledged us. Somehow, we were emboldened after crossing the first one; so while fear still loomed, we managed to ride ahead. 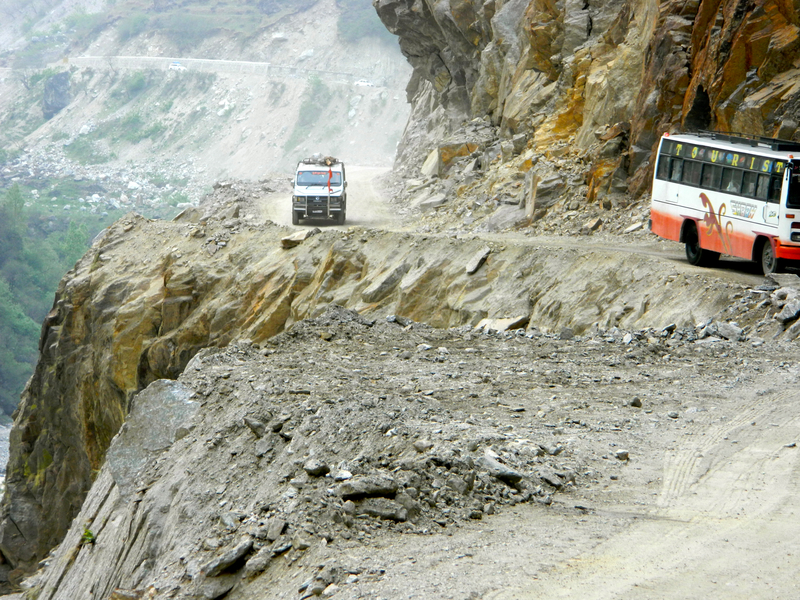 As the journey came towards its end, with Badrinath about 1km away, we found tar-coaled roads again – what a luxury! It took us 70min to cover the last 10kms! At 4:45pm, came our destination and we stood proud posing alongside the milestone. Snow-covered peaks all around us, a sign showed we were at a height of 13000 feet above sea level! We did it! I patted Nitin’s back with pride and affection – it was his maiden trip to the mountains and he answered the call with full guts and glory. Now was the time to search for a night-halt. 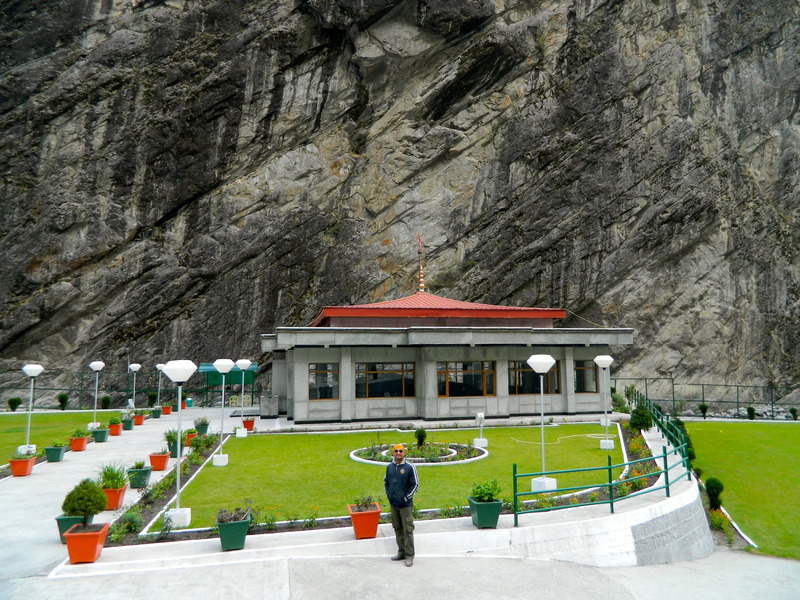 Sarovar Portico, the best property at Badrinath was all packed. We searched in vain for a decent looking guesthouse or hotel, which could provide us a clean room with a hot-water bath – the grime on our clothes will tell you why! Though the town is full of neat and clean places to stay – all good hotels were sold-out and the rest didn’t provide hot water! As we enquired around, we came across a small, six-room property on the main road – ‘Nar Narayan Guest House’. The manager, a talkative yet friendly person, offered us a clean room with geyser – all at Rs.1700/- for the night; what else could we ask for! Visiting the temple is another task – you have to queue up for the entry-token, which has a time-slot mentioned on it and that entitles you to another queue of devotees at the allocated time, inching you towards the temple. The two queues take an hour each. Each person gets 5 tokens – entitling an entry to 5 people. Then you walk up towards the temple, across the Alaknanda River – the sight is amazing! It grips you with some feeling – nearly 800,000 devotees visited this shrine in 2011, battling the terrain and weather. Some faith! As the evening set in, so did the chill; within half-an-hour, temperature dropped to about 8 degrees – this was 7:30pm only. Shivering, we crept towards the temple. Finally our turn came, and we were hustled inside the temple. We offered our prayers briefly and walked out. It had started to drizzle by this time; we quickly rushed to a nearby eatery – Saket. Really good food was served here; we thanked our stars – our bodies badly needed some energy. With ample Volini sprayed on our backs, we dozed off. Surprisingly, that night both of us saw the same nightmare – how would we cross the ditch with the flowing water the next day!! Day 3 – 19-May: Badrinath-Devprayag; 226kms. Since now we knew what lay ahead, we started off at 7:30am. The chill in the weather numbed our fingers – riding a bike in this weather on such terrain can be really excruciating. While we were carrying our gloves, we trusted only the grip of our bare palms to negotiate the no-road stretch of 10kms ahead. Much to our surprise, we crossed this stretch without much ado this time – we somehow had learnt our lessons in courage while ascending yesterday! Drive till Gauchar was uneventful and I won’t bore you with details. However, when everything goes just fine, there comes another challenge. My Enfield’s rear tyre got punctured somewhere on the poor stretch between Gauchar and Nagrasu. We halted at ‘Dehradun Automobiles’, a Mahindra Dealership at Nagrasu. Rudraprayag was still 16kms away and it was 2pm. We spotted a tyre-repair shop; we found that the owner had gone for lunch-break. Half-an-hour later, when he returned after receiving our call, he took well above 30 more minutes only to tell us that he does not have an L-key to open the nuts of the upswept exhaust of my RE, without which the rear-tyre couldn’t be dismounted! Face the challenge, biker; here it comes! We decided not to sit wanting, and Nitin walked up to the Mahindra dealership, requesting the manager to help us with dismounting the tyre. The mechanic – the super-helpful Rajinder Singh Rana – got into action immediately. He was nervous – he had never touched a RE in his life. Armed with an L-Key, some encouragement and help that I could offer and the knowledge of the RE I possessed, we took our time to dismount the tyre, get the puncture repaired, take out the culprit nail and re-mount the tyre – another 60 minutes went by – the luxury of day-ride-time went waste – good two hours. Short of time, we revised our night-halt destination to Devprayag from Rishikesh. It wasn’t just possible to cover 150kms during remaining daylight hours. It wasn’t before 4:45pm we started again; only after thanking and rewarding the Mahindra mechanics. They were our real saviours in the ordeal. Learning; add a L-key to your tool-kit, if you have an upswept exhaust – it pays! And always carry an extra tyre-tube. Learn to repair your bike – that’s a must too. Did we think the challenges ended here? Nah! Himalayas test your grit without fail, they do. After all, you have dared to score a victory over them. Just before Rudraprayag, we were welcomed by rain and storm. Now, those of your who haven’t experienced this weather in the hills, you need to face it to understand how it feels when the winds swerve your 190kg Enfield; when stones fall like rainwater from atop the hills and pose a threat to the bike, causing it to slip down the road at any moment. We drove for another 8kms in this weather, before halting at a petrol station near Bhatt Resort again. While we filled our fuel tanks, we contemplated about staying overnight at Rudraprayag itself. Covering 70kms more to Devprayag seemed like a real threat – a grave one in this weather. However, luckily the rain stopped and we dared again. Braving the weather and terrain, we arrived at Devprayag at 7:30pm, nearly at the fag end of daylight. The best place to stay here was Ramkund Resort, which was all full with travelling tourists, offering no vacancy to travellers like us. However, the hotel manager was gracious enough to help us with a booking at nearby Motel Dev Ganga – a neat night-stay with clean room at Rs.1500/- – air-conditioned! Slept we both – like tired horses. After all, we had covered 226kms of mountainous terrain – despite being paused by tyre-puncture and stormy weather during the day. Day 4 – 20-May: Devprayag-Gurgaon; 321kms. We started the day at 8:30am and rode non-stop till Rishikesh. First we thought of stopping here but finally didn’t and continued till Haridwar. Again thought of taking a breakfast-break, but the 5km jam at Har-ki-Pauri bypass took the hunger out of us. We kept riding at the fag sides of the road, much to the snooping eyes of car-travellers who were stuck in this long jam till Kankhal. 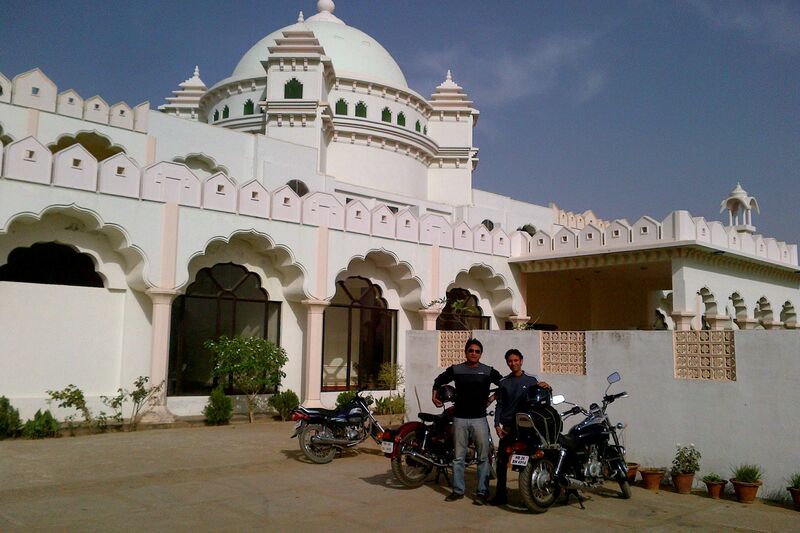 We kept riding and stopped only at the Patanjali Yogpeeth – Baba Ramdev’s Ashram. It offered one respite to us, an air-cooled eatery with fresh juices and sprouts on the menu! After riding for almost 110kms at a stretch without a morsel and any break in the heat of the plains, this halt came as a real breather. Ample liquids gulped, this time we took the route via Roorkee, surviving the massive jams at Purkaji and took our next halt at Bikano Food Plaza, as we hit the toll-road near Muzzaffarnagar, treating us with ice-cream shakes. Here it said ‘Delhi 170kms’. With an amazing road ahead till Meerut, we again took a stop at Café Coffee Day – gulped more liquids and kept negotiating the heat wave. Take my advice – liquids are the only way to sustain long motorcycle rides. While each one of us may have different energy levels, I still recommend a water break every 40-60min. A 5-minute break gives you ample energy for another 50kms, for sure. Nothing eventful happened for the rest of our journey. As it were a Sunday, we didn’t face traffic woes at Modi Nagar or Mohan Nagar and entered Delhi at 6pm. With low traffic encountered even inside Delhi, we reached Gurgaon at 6:50pm, just when the weather again gave into a storm. We had come full circle – started and ended both with a storm at Gurgaon! Covering 1100kms exactly in 4 days – 46 hours on the road! I am sure every biker calls every long trip a memorable one – I am no exception. This was one of the most memorable trips I ever undertook. Covering an average of 275kms everyday, including a 600kms hilly terrain, was indeed a tall feat for me. It pumped my confidence in myself, my stamina to weather it out the next time. Best time of the year to cover this trip is May. June first week onwards, when the gates of Hemkunt Sahib open, the traffic increases manifold. However, early June is good, in case you wish to cover both the shrines. I would recommend you avoid the rainy season – danger of accidents increases a lot. If you are starting from Delhi, plan the trip in the similar manner as we did. Gave us ample sleep at nights. Never ride without a helmet, including a visor. There is no such thing like cool breeze kissing your face and other similar cool stuff! My visor has marks of all stones that hit it like a bullet after coming under the tyres of a car driving ahead of me, and visor is the only thing that saved me from going blind! Speed thrills – and kills! Especially on the mountains. An average distance covered of 30kmph is simply great. Aim anything higher – you’re are risking way too much. Adjust! You may need to sleep at the tiniest of the rooms wherever weather forces you to stop. Sometime, inside a sleeping bag underneath a bus-shelter! Learn to repair the minor issues of the bike. DIY is the key! Do carry the toolkit and spare tyre-tubes. You may need them at the unlikeliest of places. Courage is good. However. unwarranted risk-taking can be fatal – don’t drive once it gets dark in the mountains. Start early. Drive slowly. Stop riding before it gets dark. Don’t honk while on the hills – drivers there value the code of the road – they give pass on their own wherever feasible. Water-breaks are the key. Keep yourself hydrated and avoid hogging at nights. Poor stomach kills your stamina. This ride is meant for riders with intermediary to expert riding skills. Beginners should first do few two days 400-500kms trip to test their stamina. Now, before I sound too preachy, I should stop writing any further. After this trip, I have fallen in love with my new Royal Enfield Classic 350 all over again; this is the bike of the true bikers – always game for a new challenge! Try riding it to believe it. Till the next ride, good bye and safe riding! For a true Royal Enfield enthusiast, a long ride is always a pleasure, and last weekend was one such gratifying ride. I was meaning to drive to Ajmer for a good while now. Last weekend, Nitin, my younger brother and a recently-christened biking-enthusiast, encouraged the idea and we geared up for a good 750km ride – Gurgaon-Pushkar-Ajmer-Gurgaon. Since it was a spur of a moment decision, we started pretty late on Saturday, at about 1pm from Gurgaon. Clear, bright sky and pleasant weather were inviting, and we filled our tanks to their fullest limits. Gurgaon-Jaipur highway has always been a great drive. Even with massive construction going on the NH-8, we navigated easily. After Manesar, city traffic paved way to an easier highway passage and we drove with considerable effortlessness. First three hours were really energizing and with a couple of water-breaks in between, we drove non-stop and took our first rest at the 153rd milestone. Thanks to the Café Coffee Day, at the A-1 Plaza just before Chandwazi, we relaxed for 30-minutes, treating ourselves to some cold coffee and chocolate brownies! Voila! The road after A-1 Plaza was a sheer delight, and we easily cruised at about 70-90KM an hour. Turning right from the Jaipur bypass, we took the Jaipur-Ajmer highway. Some road that is, my friends – absolutely fantastic! I have driven on hundreds on roads all over India, however, this turned out to one of the best of all. Other than a 10KM under-construction stretch near Jaipur, this highway is a true biker’s fantasy. Setting sun and cool breeze on our faces and very disciplined traffic – we charged up again, and started another leg of 170KMs towards Pushkar. I would offer one caution to the bikers riding on this road. While the road is generally great and traffic is orderly, one should drive with great alertness during the first 25KM stretch after entering the Jaipur-Ajmer bypass – continual patches of this road are not properly tar-coaled and thus, pose a grave danger of bike slipping badly. We experienced this hurdle even while returning from Ajmer. All credit to my Royal Enfield’s great balance and superb ground-control, we passed this stretch and next 100KMs were real fun. In fact, Nitin enjoyed this part the most. After all, he has driven all his life in heavily congested roads of Lucknow and Delhi and this was his first such experience. We took our next break at the Gujarati Dhaba, about 70KMs from Ajmer, at around 7:30pm. Grime & dirt all over us, tea came as a refreshing breather. We were amazed to note that neither of us was exhausted as yet, despite riding for about six hours and covering nearly 260KMs. My single-seater Enfield drew a lot of attention here from a group of Gujarati bus-travelers, who gave the bike and me envious looks! After all, nearly all the Indian men have secretly harboured a wish to own one! Last 20KMs towards Ajmer are under construction – the Kishangarh-Hanumangarh highway. One should drive carefully here; traffic can go as slow as 20KM per hour. Also, vigilantly watch out for a small diversion from under an under-construction flyover, which bears a signboard towards Ajmer/Pushkar that will take you to a village road leading towards Ajmer. Another 8KMs on this road, you should take a right turn from under the railway bridge. 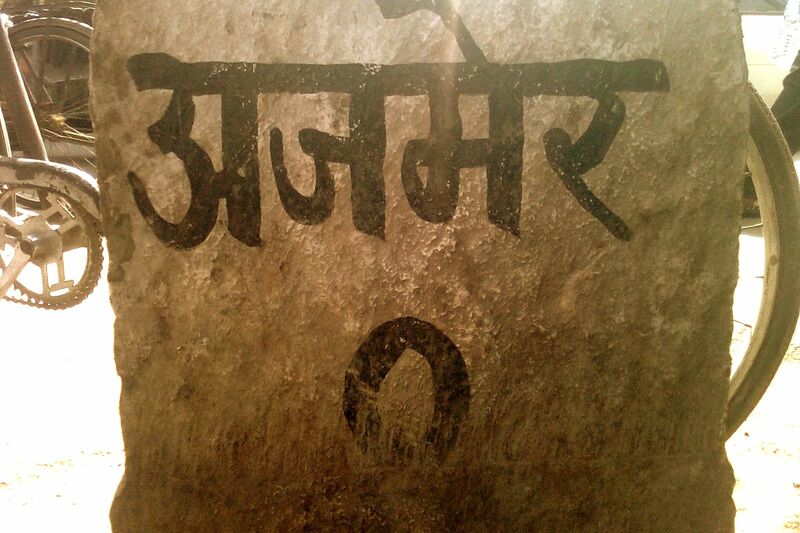 Here you’d note a huge signboard stating ‘Pushkar 22KM’. This one too is through villages, albeit very well built state-highway. It was around 8:30pm and last 20KMs to Pushkar were as enjoyable as the first 350KMs! We reached Pushkar at around 9:20pm. Another surprise! Gulab Niwas Palace – our night-halt destination, was an old Rajputana Haveli! Standing tall over a hillock, it was a marvel. We met Shakti, the proud owner, who greeted us as we entered. I must give credit to my friend Yudhisthir Singh for organizing this lovely place for us. Highly recommend for the splendid view it offers of the town of Pushkar! Guys! After reaching there is when we realized how badly we needed a scrub & bath – grunge, soil and tiredness – writ all over our faces! Treating ourselves to a hot-water bath and sumptuous vegetarian meal, we slept like tired horses! Next morning, the royal beast started with a loud thump; no sign of fatigue it showed! That’s the power of this machine. Some notes on Pushkar: it is a town in the Ajmer district in the Indian state of Rajasthan. It is one of the five sacred Dhams (pilgrimage site) for devout Hindus, and has in recent years become a popular destination for foreign tourists. One of the oldest cities of India, it lies on the shore of Pushkar Lake. The date of its actual origin is not known, but legend associates Lord Brahma with its creation. It is mentioned that Brahma performed penance here for 60,000 years to have a glimpse of Lord Vishnu. You should visit this temple and the lake, if you may. Pushkar is also famous for its annual camel fair, which takes place in November and continues for five days and these five days are a period of relaxation and merry-making for the villagers. This fair time is the busiest time for them, as this is one of the largest cattle fairs in the country. Animals, including over 50,000 camels, are brought from miles around to be traded and sold. One of the greatest attractions! We didn’t spend much time at Pushkar, as our destination was the Dargah at Ajmer, a place I have been meaning to visit for over a decade now. 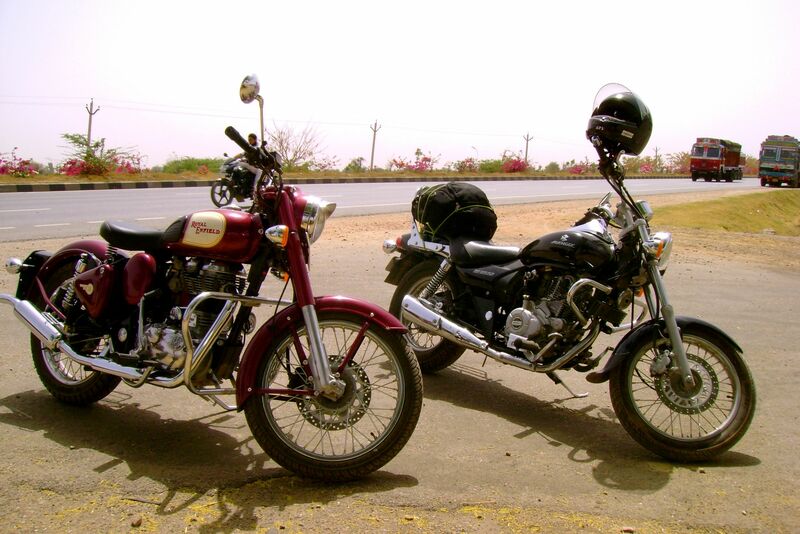 Ride to Ajmer is about 17KMs and a hilly one, albeit very well maintained road makes it a pleasant drive for a biker. Some notes on Ajmer: fifth largest city of Rajasthan, Ajmer is surrounded by the Aravalli mountain range. 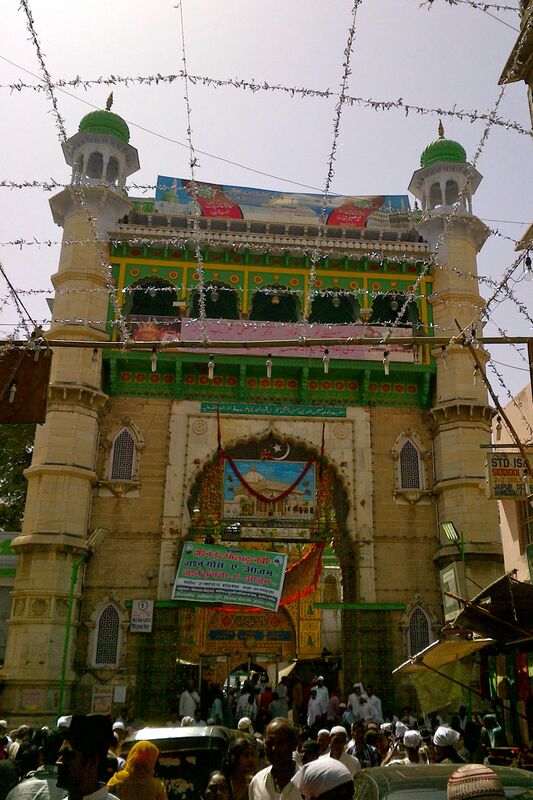 It is famous for the Dargah Sharif or Ajmer Sharif, which is a shrine of the revered Sufi saint, Khwaja Moinuddin Chisti, also known as Garib Nawaj. The Dargah, which is visited by Muslim pilgrims as well as Hindus and that of several other religions and faiths, is a symbol of inter-communal harmony and attracts devotees from all over the world. History has it that Emperor Akbar and his queen used to come here by foot on pilgrimage from Agra every year in observance of a vow he had made when praying for a son. The large pillars called ‘Kose (mile) Minar’, erected at intervals of 3 kms (2-miles) the whole way between Agra and Ajmer, marking the daily halting places of the royal pilgrim, are still extant. 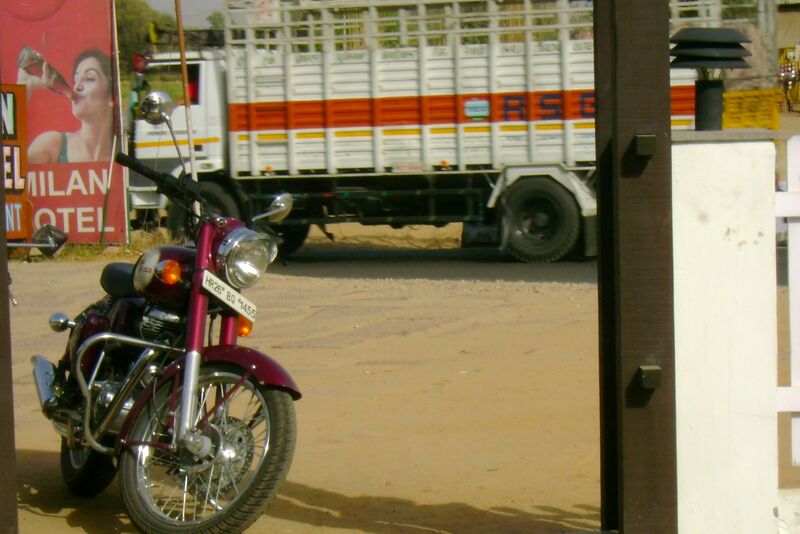 Road-travellers will see them all through the sides of Delhi-Agra and Jaipur-Ajmer highways. 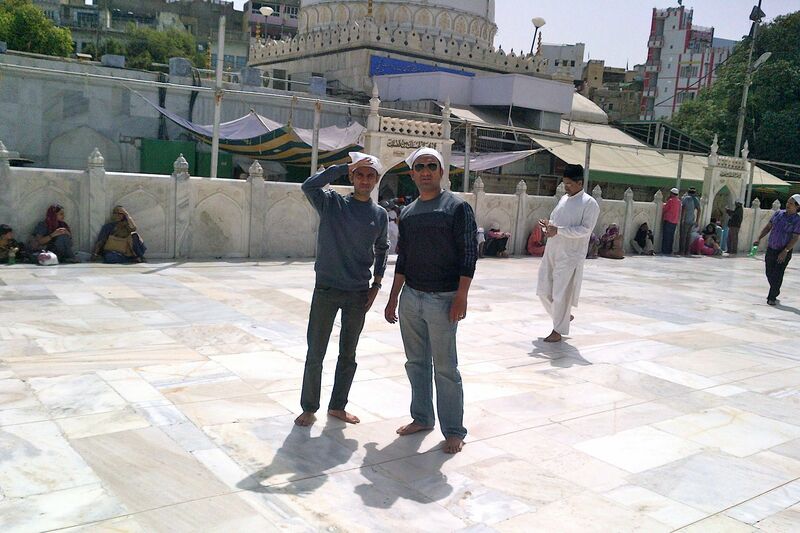 Again, courtesy Yudhisthir’s contacts, we met Bharat Yadav, owner of the Surya Tours & Travels, Ajmer. He helped us park our bikes safely with the luggage and sail though the Dilli Gate, leading to the main entrance of the Dargah, the Nizam Gate, following which is the Shahjahani Gate, which was erected by Mughal Emperor, Shah Jahan. It is followed by the Buland Darwaza. The disarray of the crowd increased as we inched inside the Dargah. Once inside, we were introduced to Khadim Mustafa Bhai, who gave us a guided tour of a very heavily crowded Dargah. Bharat shared that Khadims are the ancestors of Sufi saint. A man of heavy clout, Mustafa Bhai ensured we glided through the hordes of devotees, thronging the Dargah. As we walked in, we observed the marvelous Mughal architecture; built by Emperor Akbar and his descendants. I must share; there is something serene about this place, much more than being sacred. There is a strong sense of peace, a rare calm amidst the entire crowd, all the chaos. One has to visit this monument and feel it; I would find it very difficult to find words befitting the feeling. We started our journey back to Gurgaon at around 12pm and drove very comfortably, soaking the cheerful sun. Water-breaks every 50-60KM kept us amply hydrated and we drove to our first break near the Toll-Plaza offices near Jaipur, about 170KM from Ajmer. Interestingly, it took us only three hours to cover this distance; such was the highway! Our second break came soon, at another 60KM, at a Café Coffee Day on NH-8, where we treated ourselves to another round of cold coffee with loads of ice cream! May Khwajaji bless CCD for opening so many outlets on the highways; they bring much needed energy to the bikers’ bodies and the rest to the bikes. I would recommend bikers drive carefully after this place, especially around the edges of the road, as the on-going massive construction has led to sand getting deposited at the roadsides, making them really slippery. Nitin in fact slipped near Bahror, causing damage to his bike’s handlebar. This accident caused an unwanted break in our journey and marred rest of the drive, limiting the speed to sub-50KM/hour. We reached Gurgaon at about 9pm, covering exactly 738KMs in two days. Surprisingly, we weren’t really as exhausted as we had imagined! Best was, my Royal Enfield gave no sign of any trouble and the thump has even got better since this ride. This was my first major ride on this new machine and it didn’t let me down. I would recommend this trip to all Royal Enfield enthusiasts. You must take this tour! 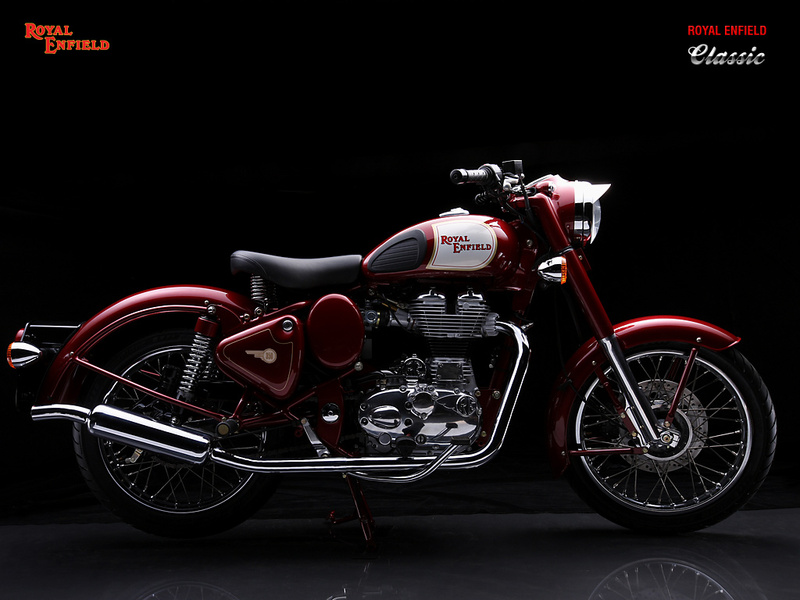 Completed 1000 kilometers on my new mean machine…Royal Enfield Classic, in less than a month. It is an absolute marvel, and as a single-seater bull, it is the driver’s delight – Selfism! I bought this machine after a long year’s deliberation. With few cars and bikes already at home, it was a dilemma – should I go for it, or not? Will I be able to ride it to my fullest enthusiasm of old times or the hectic work-life will take over after a month? When the desire prevailed over the dilemma, next big question was – should I go for the height of selfism – the single-seater option – the one I always wanted to cruise upon? For a much married man, that’s some feat to be achieved! Finally, wify supported and the royal beast came home last month, sporting a single-seat. And what a pleasure of 2012 it has been till now! I’ve been a Royal Enfield enthusiast for last 15 years now, driven the ’80s model as well the new engines of the millennium all these years. However, fitted with a UCE engine, this one is a pure powerhouse, and I am enjoying the envious looks all around!